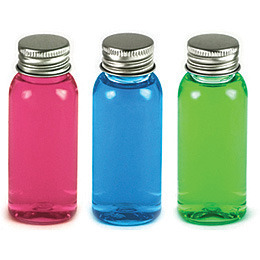 Bright, colourful fun bubble bath bottles for children. Transparent, recyclable 50ml PET bottle with silver aluminium cap. Fragrances/Colours: strawberry (pink), bubblegum (blue), apple (green).